All those Ronald McDonald’s must know what they’re talking about when it comes to the new Taco Bell breakfast menu. 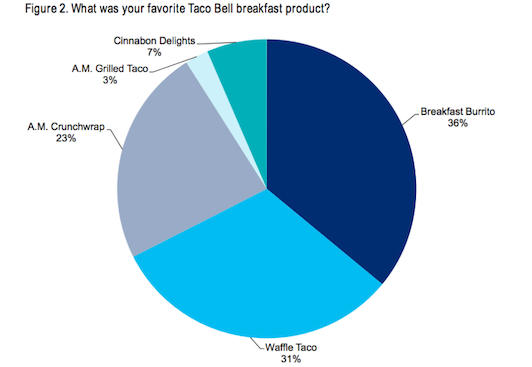 According to a new report, consumers have latched on to the concept of the Waffle Taco and catapulted Taco Bell to the top of the so-called breakfast wars. 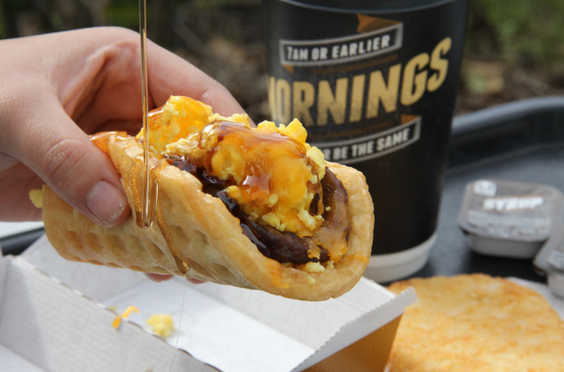 The Waffle Taco, A.M. Crunchwrap and other breakfast fare at Taco Bell have added significant sales and traffic to the fast-food chain and consumers seem to like what they’re feasting on, Business Insider reports. According to a recent Citi Research survey, 33% of consumers prefer Taco Bell’s new morning offerings over McDonald’s traditional breakfast. Free coffee didn’t seem to help the golden arches, which was only preferred by 24% of consumers. However, nearly 43% of consumers said they would eat their first meal at either fast food joint. So what’s the favorite breakfast item at Taco Bell? Survey says: the Breakfast Burrito, of course. The burrito was preferred by 36% of consumers, while the Waffle Taco was a close second with 31% of consumers saying it was their favorite. And that could be just the case. The survey found that the newfound love of breakfast won’t slowing down, as 61% of consumers who preferred Taco Bell say they plan visit the restaurant once a week for their breakfast fix.